Artfix's Universal Primed canvas is prepared by hand application of up to four layers of universal acrylic primer and hand sanding. This results in a ground that replicates the characteristics of canvas that has been primed with oil-based primer, but with the durability and elasticity of acrylic primer. 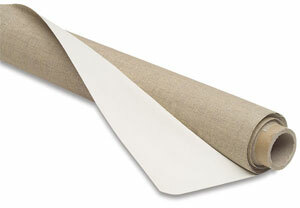 Universal primed canvas is suitable for use with both oil and acrylic paints. For over 40 years, the Narozni family has been crafting fine art supports in Provence, where the warm climate is ideal for slow and stable drying of primed fabrics. By combining time-honored European methods with modern chemistry, the family produces a conservator-grade painting surface that assures the artist's expression will survive the passage of time. Using the finest Belgian linen with the longest natural thread (fewer knots) creates a strong, flawless surface. Double sizing provides protection against oil paints, allowing uniform "breathing," which reduces paint film stress. Mural Linen Canvas, Triple Primed — Artfix's mural linen has a heavier thread and a tight weave. It is extremely extremely strong and durable, perfect for very large scale works of art. Medium Texture Linen, Double Primed — Medium texture linen is very strong, with a tight weave. It can be used with any style of painting. The texture is similar to that used in commercially available stretched linen canvases. Extra Fine Texture Linen, Fine Texture Linen, Quadruple Primed — This is Artfix's finest portrait canvas, with an exceptionally smooth and uniform surface, for painting styles that emphasize precision and detail. Fine Texture Linen, Quadruple Primed — This portrait-grade canvas has a tight weave and a fine, even grain, for painting styles that emphasize precision and detail. These Artfix linens are available with both a universal acrylic and an oil-based primer. Swatch photos depict the linen, both primed and unprimed.